The Huron-Wendat and Petun were Iroquoian-speaking nations who lived in the area around Georgian Bay and Lake Simcoe in southern Ontario. The Huron-Wendat were agricultural and therefore less nomadic: people who move from place to place in search of food or fresh grazing lands.nomadic than the First Nations who relied on hunting for food. They grew corn, beans, squash and pumpkin. The Petun, a neighbouring group, also grew tobacco which they used as a trading commodity. The corn was dried and pounded and sometimes made into a corn soup called sagamite. Women generally managed the agriculture and the gathering of wild foods while the men would hunt and fish. They used weirs weir: a fence of stakes or broken branches put in a stream or channel to catch fish. on nearby streams to block the fish so they could catch them. Nets were used in Georgian Bay. Hunting was more difficult. There was little in the way of local game because the Huron-Wendat lands were so densely populated. This meant the men would go off on major expeditions to find deer which they would share. They used the meat for food, but hunting was more important as a source of hides for clothing. 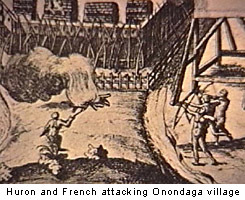 The Huron-Wendat lived in fortified villages. Their longhouses were made of arched poles covered with sheets of cedar, elm or ash bark (birchbark wasn't prevalent in this area). Some of the longhouses were very large, measuring 45-55 metres in length and 11 metres in width. Fires ran down a centre corridor and each fire was shared by the two families opposite it. Along the sides there were raised platforms for sleeping. Each village moved every 10 or 15 years when the soil became too depleted to grow good crops. Within a village there were several different chiefs representing different clans. Some were civil chiefs; some were war chiefs. They achieved chief status through inheritance, but they also had to have ability in hunting and warfare. The chiefs met in councils to discuss issues and once a year there was a council of the whole Huron-Wendat Confederacy. Family lineage was through the mother (matrilineal). The Huron-Wendat believed that all things - people, animals and inanimate objects - had a spirit or soul which must be respected. They felt dreams were very important and shouldn't be ignored since they were a communication of the person's soul. One of their most important social and religious festivals was the Feast of the Dead. Every 10 years or so (usually when a village moved) the temporarily buried bones of all the relatives would be dug up and carried to a central burial site where several villages gathered with their dead. The bones were all buried, with great ceremony, in a central burial mound called an ossuary ossuary: a place to hold the bones of the dead.. This experience united the people of different villages and provided an opportunity for the elders to tell stories and pass on the accumulated history of the tribe.